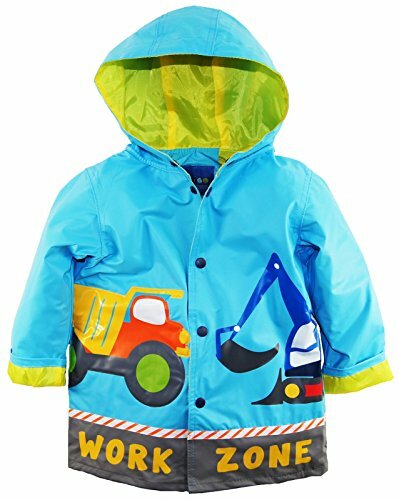 Wippette Little Boys Waterproof Work Zone Construction Trucks Raincoat Jacket, Blue, 6 by Wippette at SCRHI. MPN: 19-sty-17-2-Blue-6. Hurry! Limited time offer. Offer valid only while supplies last. Classic hooded raincoat with snap closure, 2 side pockets. Waterproof, It's a fun and playful look for sure to brighten up even the dreariest day. Classic hooded raincoat with snap closure, 2 side pockets. Waterproof, It's a fun and playful look for sure to brighten up even the dreariest day. Wipe clean with damp cloth, hang to dry. Constructions Trucks. Work Zone Design Irresistible and eye-catching, stylish and upscale rain coat. Side entry pockets. Windproof and Waterproof. Solid color taffeta lining. Can be worn every day, all spring, summer and fall. A raincoat that is as rugged as your little one, this fun design will have many adventures with your little explorer. Comfortable. Soft and Flexible. Made from premium quality with a lightweight. Wipe clean with damp cloth. Hang to dry.